Long weekend, TV programmes loaded with seasonal nationalism, and sudden increase in the sale of national flags at the signals, this Independence Day promised everything the same as every year. While the parades are still every inch glorious as they used to be, I wondered what else could be explored as an extension of the Independence Day spirit. 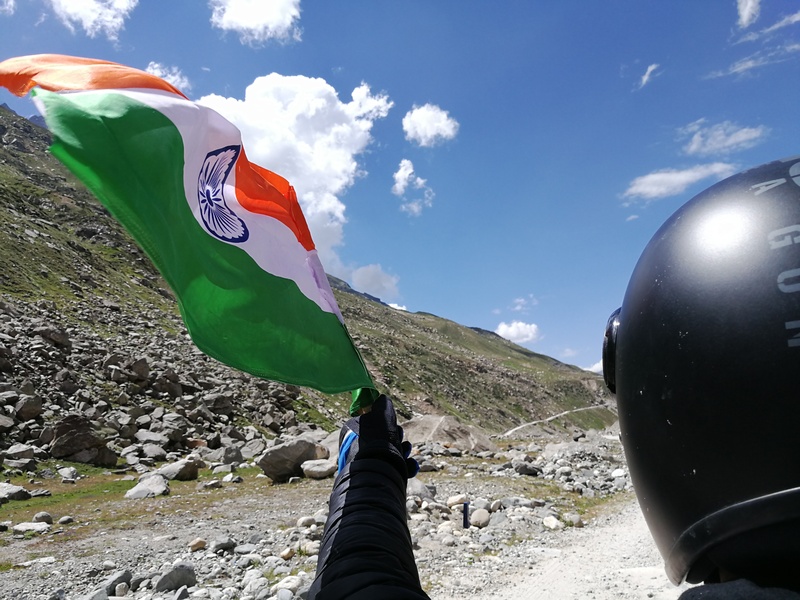 Normally, I am not somebody who would identify as a biker, but this time, when my good friend and dear brother-in-law told me about his wondrous plan of riding all the way to the Manali-Rohtang-Chandratal pass, I was thrilled. For a biker, there is only one way to mark each Independence Day – with a ride. I, on the other hand, had anyway been on a lookout for an ideal location to test out my new gadget to review, Honor 8 Pro smartphone. Things fell in place, and there I was, packing my backpack for the journey as his partner in crime. Instead of sticking to landscape beauty, this time I decided to document the people who make India what it is. When in Spiti, find some time at legendary Chandra Dhaba for food, respite and endless stories. Also, how cool is that reversible cardigan! Met a bunch of bikers on the way who were on their 4-day ride covering Leh-Ladakh. Biking is truly a passion for some! The hill and its ways. Meet Ghan Shyam, the ever so wisdomful shepherd from Mandi. Once our strenuous ride from Manali started, the traffic faded away into nothingness and was replaced by beautiful terrain and a lot of smiling faces waving occasionally. Quick tea stopovers and ‘two-minute Maggi’ kept us from feeling sluggish. Since Honor 8 Pro has two lenses (Colour & monochrome), it seemed like a good idea to experiment couple of shots, especially during the dusk hour of the day. The results were pleasant with sharp focus and great depth. This phone also happens to have a pair of dual rear cameras, which seems to be the rage of today’s smartphones, but more than that, I am really pleased with how the 12-megapixel cameras capture rather sharp and colourful pictures without putting much time into focusing. Even the night-time shots weren’t disappointing with least amount of noise caught. The battery is another killer feature which is one of the best surviving batteries I have seen in phones of this range so far. I easily used it for two days at a stretch without much difficulty and with a journey where scope of charging was limited, this little devil of a phone came rather handy. At Rohtang, the air and the life around was something completely different. Meeting people with livelihoods I couldn’t possibly imagine, listening to their stories and learning humbling experiences happened, and if for nothing, I will remember the trip for this. Dorje Bodh and his wife Hishe Chhomo at Spiti helping and serving bikers and trekkers in one of the most difficult terrains, their undying warmth and love for everyone was heart touching. The shepherd we met in Mandi, Ghan Shyam, whose whole year is nothing but a series of travel tales in a bid to survive the winters. That little shy girl who gave me flowers when I asked her if I could take a photograph of her. The list is endless. The golden moment of this trip was us finally reaching at the Chandratal Lake. Even though camping at the lake is no longer an option, we took up our camping spot pretty close, and had a great time while there. A photographer’s true paradise, I went crazy with my camera there, but not before spinning out my Honor 8 Pro to take some stunning views. With a 6 GB RAM, 128 GB storage and a microSD card support, I didn’t have to worry much about transferring the images frequently to keep the storage clear. The camera also comes with a dual-LED flash, phase detection and laser focus among others. Full marks for the sharpness of the images! Absolutely love the sharpness of colours and clarity in this shot taken from my latest gadget, Honor 8 Pro. Beats most of the counterparts (including the trending One Plus Five) in this department! Overall, these 4 days of blissful journey got me a lot (colourful) on my plate. I learned more about the people of my country, explored how life, how independence is interpreted across the regions, and reminded myself how life comes as we take it, and that’s the true meaning of independence.